Here is an update with respect to the proposed legislation to be presented to the Grand Lodge of Kentucky allowing subordinate Lodges to choose to conduct their business on the Entered Apprentice or Fellow Craft Degrees, as well as the Master Mason Degree. Elvin E. Helms Lodge No. 926 has voted to present the legislation for consideration by the Grand Lodge of Kentucky. We plan to mail the proposed legislation to the Grand Secretary on August 10 (it must be received by August 15). If your Lodge intends to be a co-sponsor of the legislation and you have not already submitted the proper documentation to me, please do so at your earliest convenience. The following article comes from the Short Talk Bulletin, published by the Masonic Service Association of North America, June 2016. Many of the “buzz words” overheard during the recent Conference of Grand Masters of North America included: change, retention, education, paradigms, connectivity, technology, social media, communication, security, perceptions, traditions and so forth. These notions are nothing terribly new. We’ve been hurling them about for years, but these days they are certainly being emphasized to a much greater magnitude. There appears to be a consensus among many that THIS IS A GREAT TIME to be a MASON! Things ARE changing in a positive way! Worthy young men ARE seeking what we offer in Masonry, and boy, do we ever need them …in a BIG way. But here’s the rub… many have done their homework. They do what they do best. They use the tools and technology they are familiar with. The internet has made the world a very small place, so they go online; read articles; research the pros and cons; delve into our historical significance; view YouTube videos showing austere men dressed in tuxedos and white gloves performing precision-driven floor work to grandiose music amidst elegant and palatial surroundings. They witness learned men of stature reciting meaningful and profound dissertations meant to provoke thought and capture hearts. They’ve probably gone on Facebook or other social media and observed images of Table Lodge banquets lined with well-dressed, distinguished gentlemen enjoying Masonic camaraderie and fine food, toasting and singing odes to the Fraternity and the glory of God. The young prospects of today come hungry for knowledge and preloaded with wonder and awe and great expectations before they ever knock at our door. They’re anticipating great leaders who will offer them guidance and mentorship — someone to fill their sails and help them navigate our world’s tumultuous waters. And if not the enlightened societies of Voltaire, Mozart, Washington and Churchill, they’re hoping to at least be accepted into a Fraternity that promotes philosophical discourse and provides instructions for personal improvement. If not drawn to the pageantry and mysteries of Masonry, young men have forever been lured by the core ideals of Freemasonry. They’re expecting Freemasonry to fulfill its purpose and do what it actually claims to do, and has done for generations. And when that ravenous neophyte finally wanders up to knock at the door of your Lodge, what will he find? Brothers, I’m of the firm belief that we do not have a membership problem — we have a new member retention problem. So even when we do gain a zealous disciple, and IF that new Master Mason can somehow manage to overlook the worn out carpet, peeling paint, dead flies on every windowsill, shoddy ritual work, empty chairs, lack of education, lousy food (I once had cold spaghetti on a paper plate), inconsistent dress code, and absence of the intellectual enrichment he’s craving, and decides not to commit “Masonic suicide” but stays on because he sees an opportunity for himself to benefit the Lodge with fresh ideas and build the Masonry that suits his needs, like his grandfather would have .. will we let him? Will we allow him to question our outmoded ways? And if we do, will we empower him to appeal our outworn modus operandi and introduce us to his world? Will we permit him to improve the menu with tastier recipes? Brothers, the answer HAS to be YES! Because in doing so, that new, young Mason will bring friends whom he knows share his same desire to affect positive change in themselves, families, community and the world. They then become the much needed spark plugs and fresh batteries to crank the engine. They’re the ones to throw a new set of tires on our dilapidated jalopy, push it out of its rut, and get it rolling under its own power once again. Listen, we all realize small town Lodges are suffering. I’ve visited more than a few that easily have enough members but are stalled for lack of a quorum. Everything has a shelf life, and not unlike that deserted carton in the back of every fridge; the one that no on wants to smell or dispose of, there are Lodges whose expiration date has long come and gone. To repeat, we have a retention problem. Quite frankly, why would a Lodge want to get new members when it cannot keep the ones it already has? What’s the point? Personally, what I’ve learned and come to know is this: no Worshipful or Most Worshipful can make someone care. No one can. To quote myself: “We can suffer all futility save that of lethargy and indifference.” All we as individual Masons can hope to do is set our standards higher, lead by example and inspire others to do the same. The core Brothers, the ones who actually show up and want to improve themselves, their Lodge and the world — YOU are the ones who have to labor even more earnestly. YOU are the operatives that must have a shared vision and a plan to enact for the future and your own destiny. Doing nothing is not a plan. Waiting for something to happen, or for some magic Grand Lodge miracle cure, is not a plan. Brothers, be prepared to smile with polished confidence when you answer. 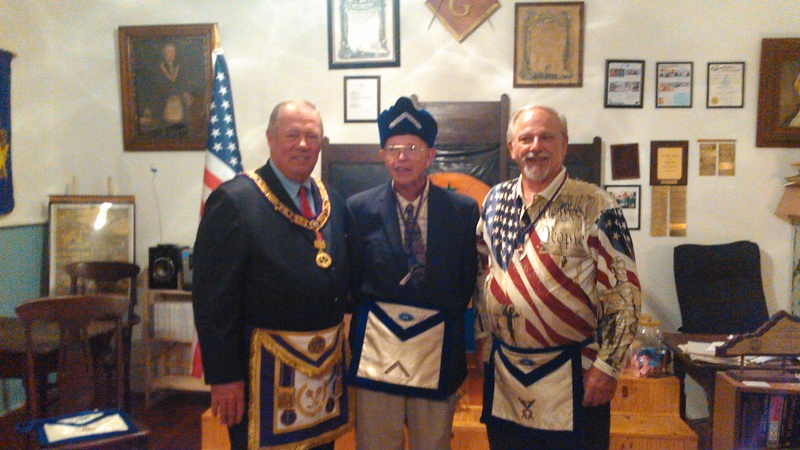 It was “Patriotic Shirt Night” at Elvin E. Helms Lodge No. 926 on Tuesday, July 12. Our Secretary, Bro. Ed Tanner, looked mighty spiffy in his red, white and blue shirt. Bro. Ed, along with WM Ernie Stratton and MWPGM Keith Dreier, Grand Treasurer of the Grand Lodge of Kentucky, are pictured above. MW Bro. Keith spoke about the day to day operations of the Grand Lodge and gave an overview of issues that the Grand Lodge handles on a daily basis. He stated that despite the fraternal nature of our Order, it is necessary to manage the Grand Lodge in a professional and businesslike manner. He also spoke about the relationship of the Masonic Homes and the Masonic Home Journal to the Grand Lodge. MW Bro. Keith further advised the Craft that although the Grand Lodge of Kentucky is a tax exempt organization, gifts to the Grand Lodge, unlike gifts to the Scottish Rite Foundation or the Masonic Homes, are not deductible for income tax purposes. MW. Bro. Keith also mentioned the success of the Grand Master’s bicycle program. As of this time, Kentucky Masons have donated 906 bicycles to local schools. District 18 Lodges contributed 78, or roughly 9% of that number. Once again, District 18 is among the state leaders in participation. Following his presentation, MW Bro. Keith was made an honorary member of our Lodge and presented with an Elvin E. Helms Lodge lapel pin. We wish MW Bro. Keith well in his office as Grand Treasurer hope that he is a frequent visitor to our Lodge. On Thursday July 7, 2016; DART Police Officer and Brother Mason Brent Thompson was killed in the line of duty during the Dallas, Texas police ambush. 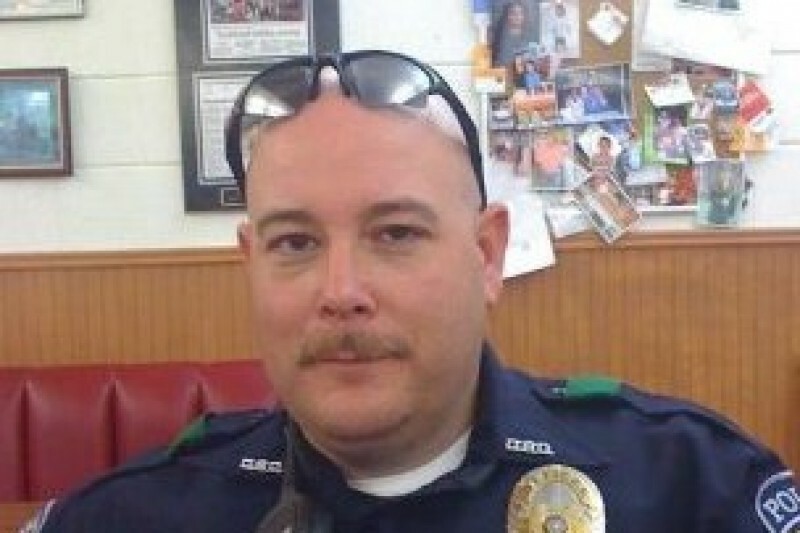 Brent leaves behind a wife, several children and numerous family members. These donations will support the family in this tragic event. R.I.P. our brother in BLUE. Brother Thompson was a member of Corsicana Lodge No. 174 in Corsicana, Texas. Click HERE to visit the “Go Fund Me” page setup to provide financial support for his family during this time. UPDATE: On Tuesday, August 9, 2016 the fundraising goal was reached.